Dodge-Khatami expands services offered by UT Physicians Pediatric Surgery clinic An internationally known pediatric and congenital heart surgeon has joined UT Physicians. MicroSeismic, UT Physicians make sound investment in children with hearing loss Access to hearing aids expands with partnership between UT Physicians and MicroSeismic oilfield services. Tiny Tot Clinic secures grant for cerebral palsy research The Tiny Tot Clinic has been selected to take part in a new initiative by the Cerebral Palsy Foundation to improve diagnosis and intervention results. Outpatient procedure to treat depression now available A non-invasive procedure can stimulate neurons in the brain to provide therapy for people suffering with major depression. The changing face of health care The changing face of health care: how some UT Physicians community-based clinics offer a unique approach for patient-centered support. 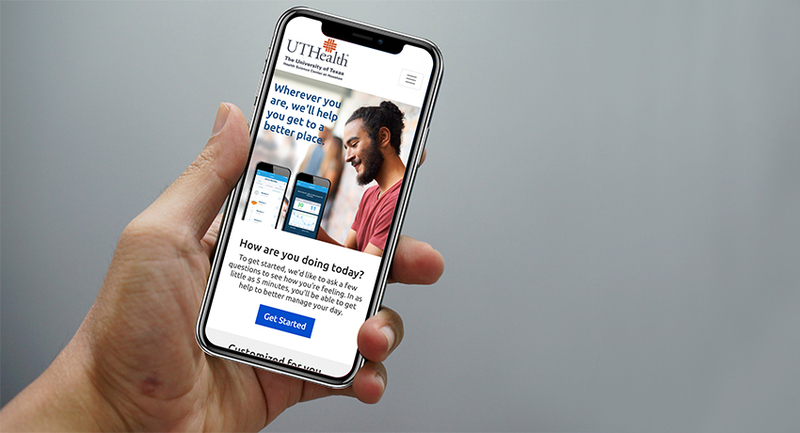 Mobile technology enhances care for obstetric patients UT Physicians is expanding access to a nationally approved prenatal app that allows obstetricians to remotely monitor their pregnant patient’s progress and health. Reach Out and Read program expands in UT Physicians clinics Well-child exams come with a brand new book at four additional UT Physicians locations. It’s part of a national program to encourage an interest in reading at a young age. UT Physicians nurse honored by Houston Chronicle UT Physicians clinical nurse coordinator honored by Houston Chronicle's "Salute to Nurses" Program. UT Physicians offers no-cost online screenings for varicose veins Finding out if varicose veins warrant medical attention can be done in the comfort of your home. ENT specialists reach out to community with cancer screenings This year, ENT specialists offered no-costs screenings at three additional locations with a record turnout. Sports physical special UT Physicians is offering a special rate for sports physicals at multiple locations across Southeast Texas. First sinus surgery in US using augmented reality technology UT Physicians sinus surgeons are the first in the United States to use augmented reality technology during minimally invasive sinus procedures. Hurricane Harvey Relief Fund awards $2.6 million for behavioral health care at UT Physicians clinics across Greater Houston Behavioral health care programs expand in UT Physicians clinics across Greater Houston to meet the needs of residents post-Harvey. No-cost health screenings, food and entertainment UT Physicians is offering an inside look at its new Jensen multispecialty clinic during a grand opening celebration filled with no-cost health screenings, fun, food and entertainment. Lowe honored as outstanding NFL team physician The Professional Football Athletic Trainers Society has recognized UT Physicians Orthopedist Dr. Walter Lowe as outstanding NFL team physician. Tiny Tot Clinic makes a difference The Tiny Tot clinic provides a team approach to assist premature babies with achieving developmental milestones. New orthopedic specialty care locations Orthopedic specialty care expands in north Houston. New PM&R sports medicine & spine clinic opens in Southwest Houston UT Physicians has opened a new physical medicine, rehabilitation, sports medicine and pain management clinic in southwest Houston. Blackwell named president of Society for Maternal-Fetal Medicine The Society for Maternal-Fetal Medicine (SMFM) has named Sean C. Blackwell, M.D., maternal-fetal medicine specialist with UT Physicians, its newest president. UT Physicians presenting sponsor of Darling Dash For the second year, UT Physicians named presenting sponsor of Darling Dash 5K to raise awareness about sickle cell disease. Carson-Pratt and Ramirez named employee of the year UT Physicians recognizes two outstanding individuals as Employee of the Year for 2017. UT Physicians at The Heights earns PCMH recognition UT Physicians at The Heights has been awarded recognition by the National Committee for Quality Assurance (NCQA). Heights clinic hosts holiday guest UT Physicians at The Heights hosts special guest to spread holiday cheer. Otorhinolaryngologists named to best doctors list Two UT Physicians otorhinolaryngologists named to Best Doctors in America list.